Work has started on the Sixth Avenue bikeway. The pic in the above tweet is at Sixth and 18th Street. The photo below, sent to us by a reader, was taken at 16th Street. 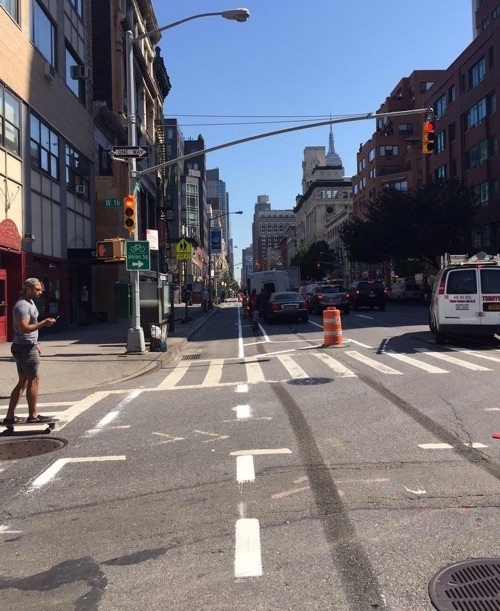 Sixth Avenue is one of the most biked streets in the city but until now cyclists have had to make do with a narrow painted bike lane next to heavy motor vehicle traffic. DOT revealed its plan for phase one of the Sixth Avenue bikeway in late 2015, after years of advocacy led by Transportation Alternatives. In January DOT announced that phase one would extend between Eighth Street and 33rd Street, six blocks longer than the original plan to begin the redesign at 14th Street. The revised plan also included some concrete pedestrian islands, which were not a feature of the original proposal. DOT has said it may extend the lane south to Canal Street next year, with a northward expansion to follow at an undetermined date. cycled this during peak Rush hour today – joyous, gobs of cyclists commuting to work, cycling politely and slowly in great big packs. One citibike gal was riding in pink high heels and looked perfectly poised. “blowing” by gridlocked motor traffic at a stately 8 MPH has its own rewards. ?? There’s more reason for it to go all the way from Canal to Central Park than for it to not. After all, it already has four motor lanes that go that entire distance. Painting just a single stretch makes no sense. But traffic is like toothpaste, y’see. You can’t squeeze it all at once, you have to start at the bottom and squeeze as you go up. Or something. Hopefully it’s not done too cheaply. To see what I mean look at how the protected lane on Lafayette clashes with the high level of left-turning movements at Houston St with no separate space or signal. Is this something that extra $50 million the City Council was offering could have avoided? Well that only took 36 years! It will be a great day for pedestrians when this is finished, they will get a new expanded sidewalk. Just like 8th Ave.
Hah. I biked this route regularly to work for 10 years, without bike lanes at all for most of the time. You kids these days, you’re gettin’ soft. You don’t know what it’s like to be caught between a panel truck and some oblivious surburbanite gaily throwing a door open in your path. I dunno, NY ain’t what it used to be. The bike lane is a few hours old. It’s incredible to think that a common sense facility like this, that has proved tremendously successful and popular on a variety of Manhattan’s most heavily trafficked avenues, still requires such a heavy lift from the advocacy and political communities. I rode up the few blocks of this lane last night and the benefits are joyfully self evident. Here’s hoping that the day comes soon when design changes like this can be rolled out on a mass scale to all of Manhattan’s major avenues, and not just in disjointed chunks over the course of years. And this lane won’t be finished until it stretches from Vesey Street to (a permanently car-free) Central Park.